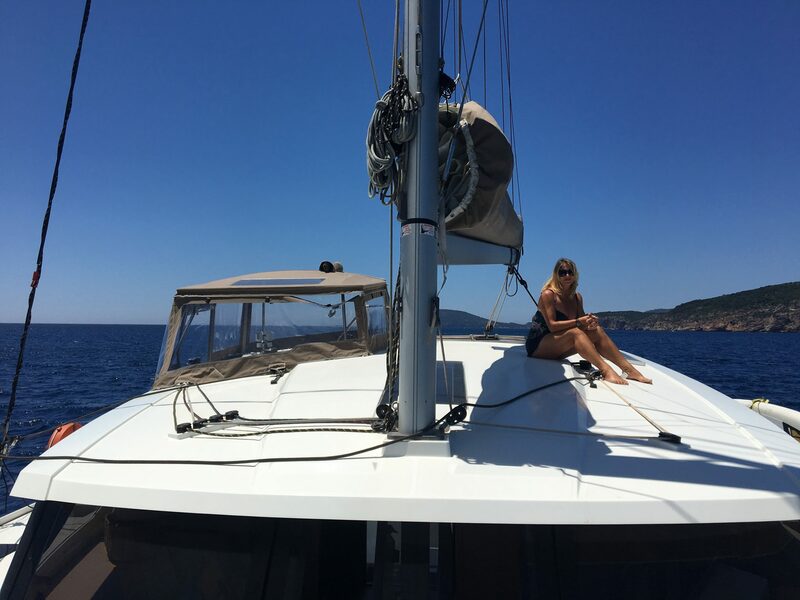 Lauren and Connan James are yet another couple who have made the decision to swap from a monohull to a Fountaine Pajot Lucia 40 multihull. Caroline Strainig asked them how they have found the transition. 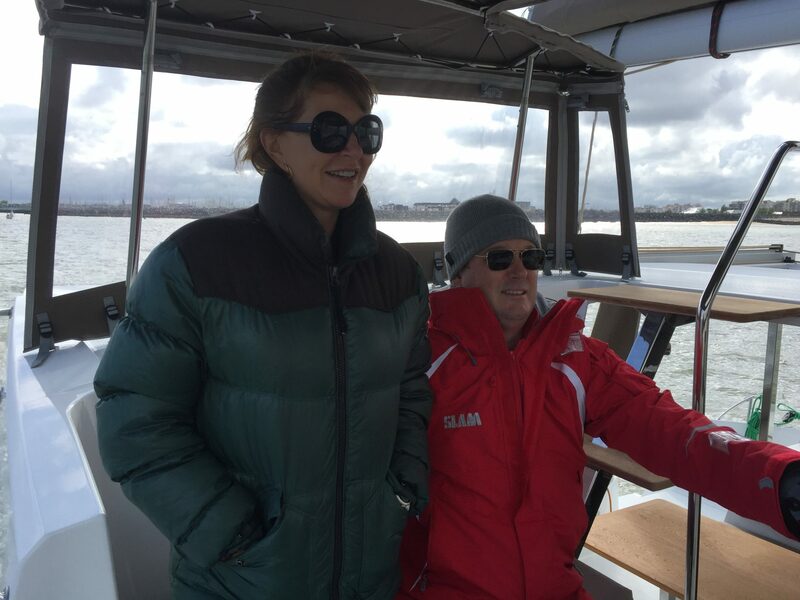 Almost two years on from taking delivery of their new Lucia 40, Lauren and Connan James couldn’t be happier with their decision to buy a multihull for cruising. There is genuine enthusiasm in their voices as they talk about their Lucia 40, which they have called Tigger. They took factory delivery in France in 2017 and have now sailed the Med for two European summers. In May they will fly back for another four-and-a-half-month stint. 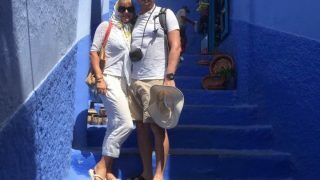 New Zealanders who live in Auckland, the couple had virtually no multihull experience when they decided to test-sail a Fountaine Pajot and buy a Lucia 40. 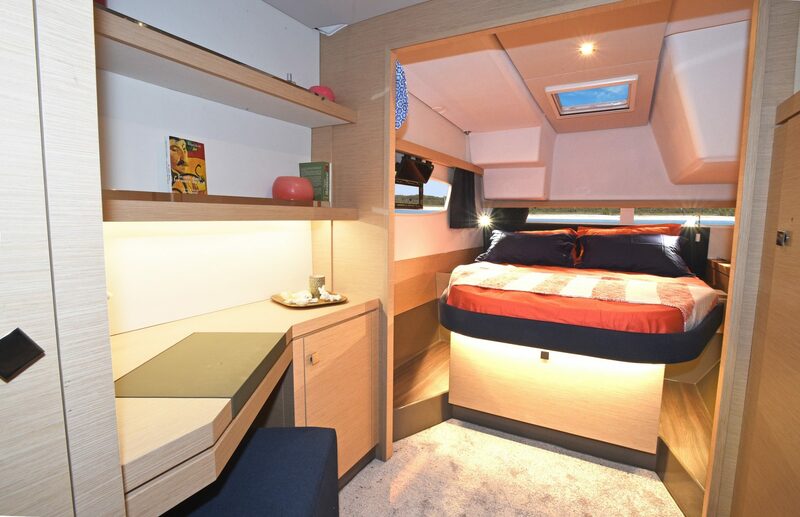 They opted for the Maestro owners’ version of the Lucia, with one hull devoted to an owner’s stateroom and the other hull two guest cabins, and love the extra space, especially when hosting guests. “The privacy and space are amazing. There are just so many different areas where you can go,” Connan said. Speed-wise, they say their 41-foot monohull was fast, but Tigger is faster, although it doesn’t necessarily feel so because the catamaran is so flat and stable. 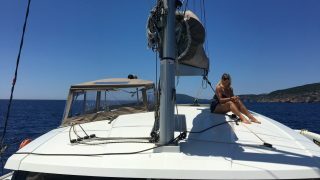 Tigger also sails better in very light winds. 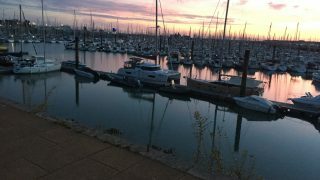 Connan tells of how they were cruising along at seven knots on an overnighter from Corsica to the French Riviera and a 45-foot monohull raceboat with all the bells and whistles came up behind them. “It was only doing one knot more and they were sitting on the rail to try and keep the boat flat,” he said. Motion-wise, Lauren still gets seasick in larger seas, especially when they are from the side. “But even on a cross-sea the stability is so much better,” she said. They say the night watches are also less taxing, thanks to the comfortable and protected cockpit. 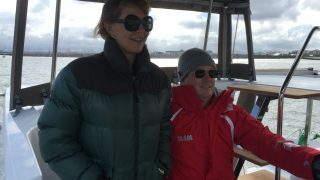 Enjoying the helm on their first outing in La Rochelle. “In the monohull you are outside in the weather getting blasted because you cannot be downstairs as you cannot not see anything forward,” Connan said. They find Tigger does not show such early obvious signs of being overpowered as the mono, because catamarans don’t heel or round up as a monohull does. However, they are conscious of this and make sure they reef or furl sails conservatively to suit the conditions. 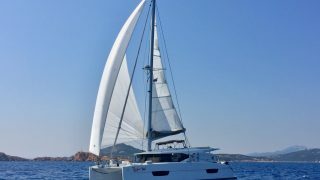 Connan says the only thing they have found which took a little while to get used to be the boat’s responsiveness to the helm, which is not as direct and immediate as that of a monohull, as is the norm with cruising catamarans. “The comfort and the space and everything are just amazing, and the sailing is still fun, but the helm feel at the wheel is totally different,” he said, However, they are now used to it and spend most of their time under autopilot anyway, so it has never been an issue. 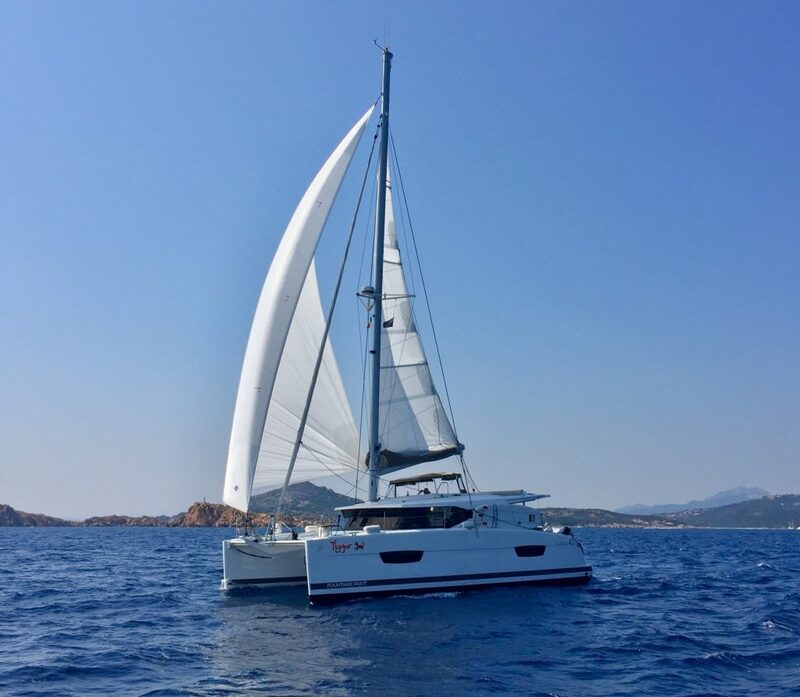 Connan says another major plus of buying a Fountaine Pajot is the option of factory pick-up in La Rochelle in France, which is becoming increasingly popular with Multihull Solutions’ clients. “It seems like madness that people ship them back to their countries,” he said. They have a long list of mouth-watering highlights they have enjoyed in Europe to date, and had trouble narrowing down the list when asked. 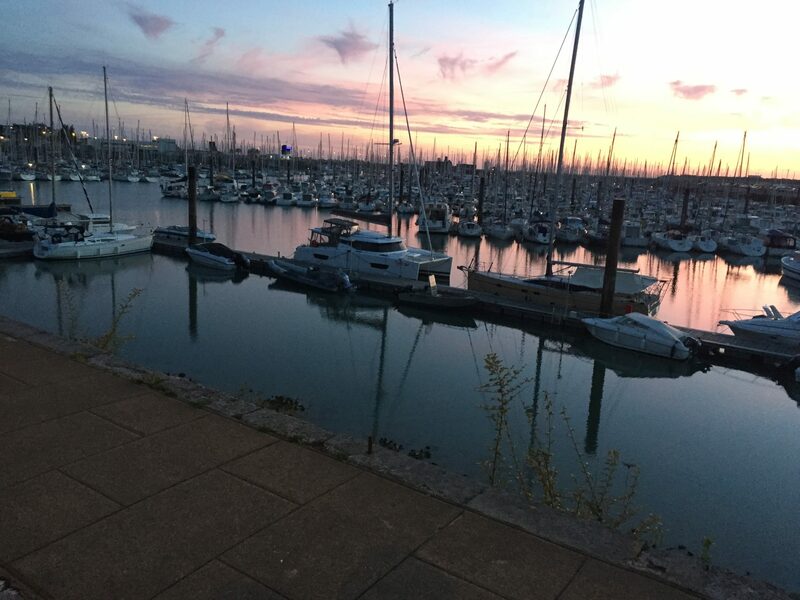 “La Rochelle itself, which is where the boat was commissioned, is stunning, as are the whole of the northern Spanish coast and, of course, Corsica,” Connan said. Lauren warned it is not always a gin-and-tonic experience though. 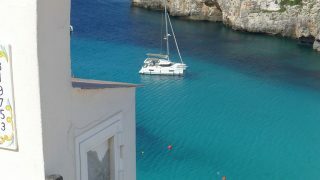 Commissioning the boat to get ready for extended cruising can take up to a month. 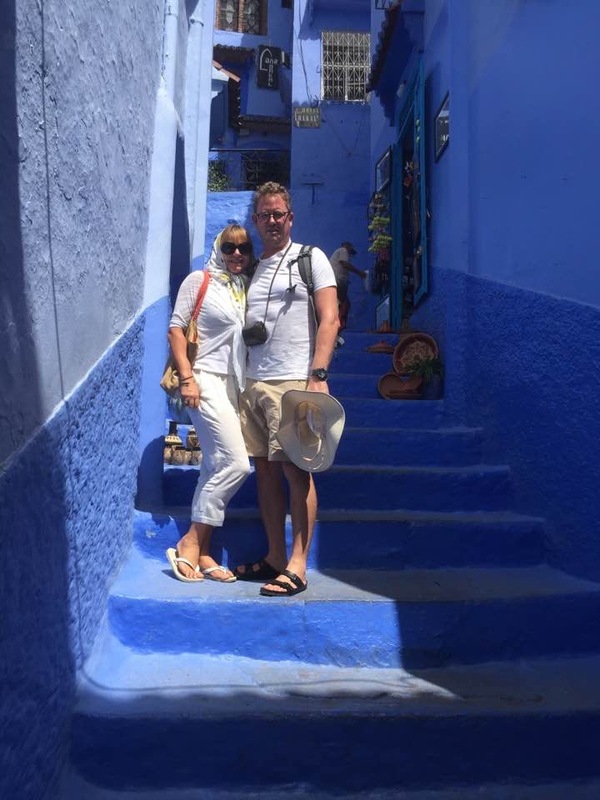 In their case they also encountered some port officials while cruising who were not aware of New Zealand’s bi-lateral visa waiver agreement and at one stage they had to head post-haste back to Gibraltar until things could be sorted out. 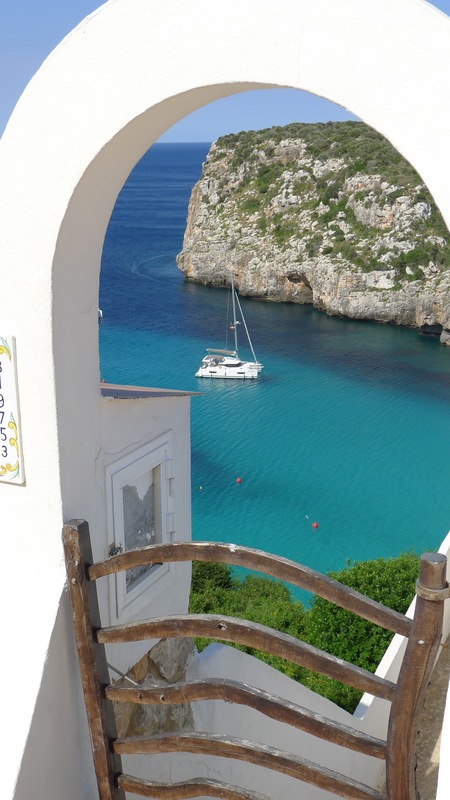 Cost-wise, they say marina fees in Europe are about 50 percent more for a multihull than a monohull on average, but they rarely use marinas anyway because they find anchoring out in the catamaran so easy. “To give you an example, we were sailing in company with friends who had a 45-foot monohull,” Connan said. Long-term, Connan and Lauren plan to tail Tigger home to New Zealand, but in the interim are enjoying their summer cruising overseas. Connan is an advertising copywriter and does some work remotely while cruising, but Lauren has retired from running her Pilates studio because it was impossible to run long-distance. However, she has plenty to occupy her, including doing all the travel planning for their European adventures and arranging for Tigger to be stowed on the hard in the off-season.